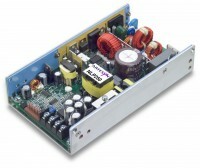 The NLP250 medical series offers up to 250 W in a U-Channel power supply. Its form factor makes it suitable for use in low-profile applications. The main output channel is compatible with systems that implement distributed power and point-of-load architectures. It can also be used to power electromechanical devices such as relays, motors and pumps. An auxiliary output is also available for those systems that require ‘standby’ operation. The low earth leakage current makes these supplies suitable for use in medical equipment.